We’ve all been there, a certain someone’s birthday, a colleague is leaving work, an anniversary or special event, you want to get a gift but have no idea what to get. You might opt for a gift card, but then you have to decide where to get it for. There is always that fear, that you have spent good money and the person you want to treat, can’t find anything they like. Problem Solved – That’s where the Elgin Gift Card comes in! The Elgin Gift Card is different from a normal store or gift card as it lets the person who gets the card choose where to spend it. With over 70 businesses (and counting!) 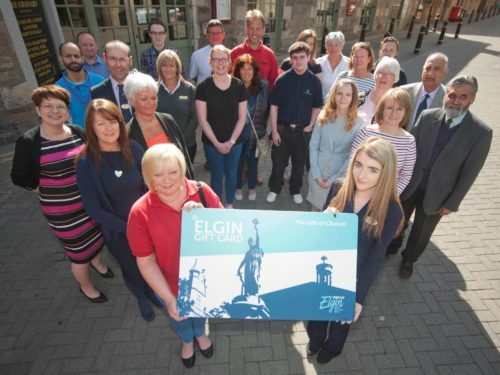 accepting the Elgin Gift Card, they can choose from a meal out, coffee and cake, a beauty treatment, shoes, a holiday, children’s clothes, a new outfit, or they can even get a steak from the butchers – the choice is truly theirs! By giving the Elgin Gift Card you are not only showing someone how much you care but you are also supporting local businesses. To buy your Gift Card you can pop into Sugar Plum on Batchen Street, Scrbbles on the High Street or Gordon & MacPhail on South Street. You can also buy them online at www.elgingiftcard.co.uk. The website will go live on Friday 8th June. If you buy them online, you have the option to have them delivered to your house or delivered to the recipient’s house. Wouldn’t that be a lovely gift to receive in the mail? When you have received your Gift Card the first thing you will want to know is where you can spend it. You can check out the map on the Elgin Gift Card website, it shows all the participating businesses – BUT keep an eye on it as the number will continue to grow! When you are shopping in town you can also look out for the window stickers that show the business accepts the Elgin Gift Card. To check the balance on your card, visit www.getmybalance.com or scan the QR code on the back of your Gift Card with your smartphone. The Elgin Gift Card is a single use card and cannot be topped up with more money. The balance on the Gift Card will expire 12 months after the date of purchase. The Elgin Gift Card will be launched on Friday 8th June. Keep an eye on our social media platforms for updates and competitions!